It’s British asparagus season! I couldn’t be happier. To celebrate I made this amazing roasted tomato asparagus pasta dish. It’s the perfect spring and summer lunch or dinner. Suitable for vegetarians and vegans. Do you love asparagus? It is absolutely one of my favourite vegetables but I try to avoid buying it out of season. 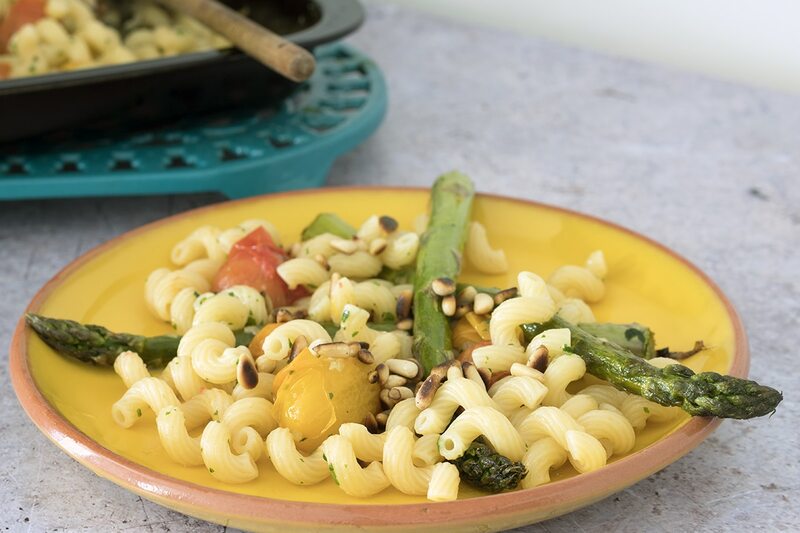 The British asparagus season is right now and this roasted tomato asparagus pasta dish is the perfect way to enjoy it. It’s a really simple recipe and involves just throwing a few things in a roasting tin, cooking some pasta and then mixing it all together. Which suits me on a hot day when I don’t want to spend ages in the kitchen. I have added pine nuts to this because I love them and I think they add a lovely savoury kick which stops me from missing cheese. A quick note about pasta portions. In our house we are quite greedy and always eat far more than the packet recommends. I have gone for a 75g serving per person here but do increase or decrease this depending on your personal preference. 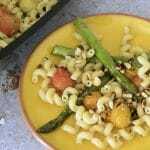 I hope you enjoy this roasted tomato asparagus pasta as much as we did. This is a very easy recipe to make. It’s as simple as chucking everything in a roasting tin and letting the oven do the hard work while you boil some pasta and toast some pine nuts. 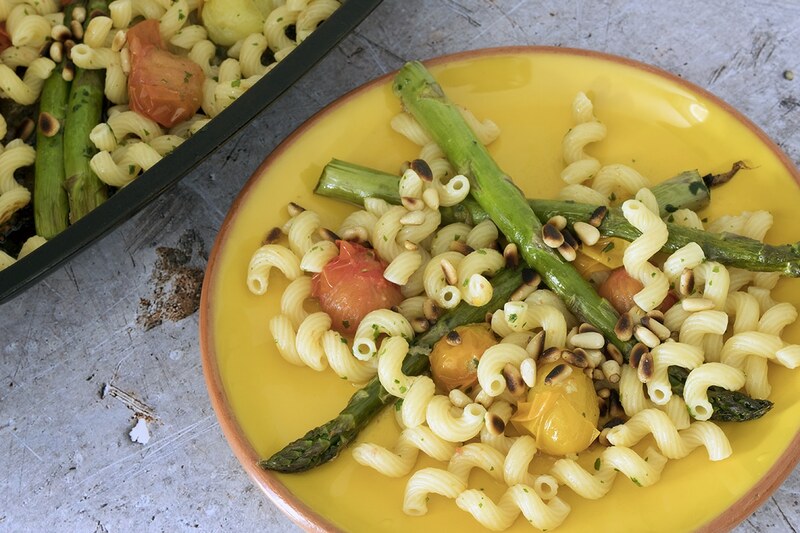 While the pine nuts aren’t essential I really do recommend that you include them as they add a lovely crunchy element to this tomato asparagus pasta dish. It's British asparagus season! I couldn't be happier. To celebrate I made this amazing roasted tomato and asparagus pasta dish. It's the perfect spring and summer lunch or dinner. Suitable for vegetarians and vegans. Cut the thick ends of the asparagus off and discard. Place the asparagus, tomatoes, garlic and olive oil in an ovenproof dish and roast for 15-20 minutes until tender. Stir once. Meanwhile bring a large pan of salted water to the boil and add the pasta. Cook until al dente, following the packed instructions for cooking time. When the pasta is almost done lightly toast the pine nuts in a small frying pan. Mix the pasta with the sauce, season with salt and pepper, sprinkle over the pine nuts and serve immediately. 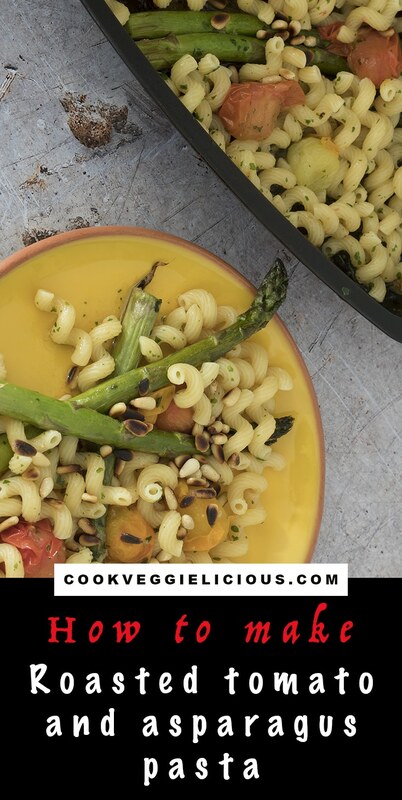 If you like this you might like my vegan rotolo with spinach and mushrooms, pasta with courgettes and lovage, this easy veggie pasta sauce with zoodles or this lentil and roasted cauliflower pasta sauce (last two pasta recipes on my kid food blog Sneaky Veg).